I don't know about you but I loooove Thursdays! There's just something about knowing that the next day is the last before the weekend that makes them sweeter to me. I particularly enjoy not having to go through the whole "looking at your watch non stop counting down the hours" of a Friday at work. Do I even make sense here? I think my Thursday excitement took over my brain hahaha. Today I have a review of the Celestial Cosmetics & Color4Nails Stamping Line. 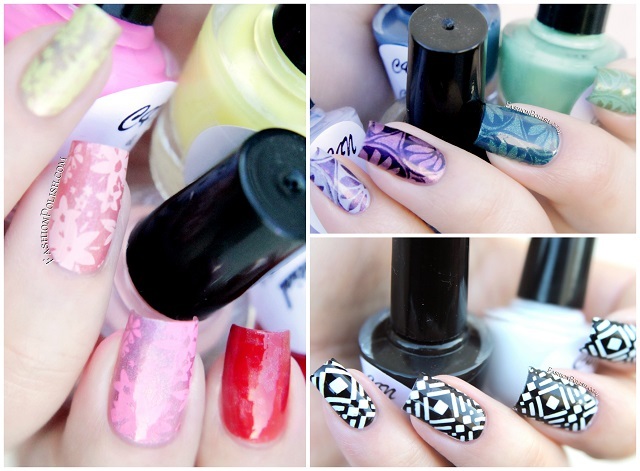 This colaboration consists of 10 bottles of 9ml stamping polishes (duh!) : 8 cremes, 1 jelly and 1 shimmer. I'll start by saying that the entire line stamps perfectly. I was able to pick up the designs I used fairly easily before stamping them over my topcoated canvases. I actually put very little effort in the stamping process. I didn't start over but rather transferred to my nails the first attempt to try and show you realistic conditions so please excuse the crooked, stretched or ill-centered stamps. All pictures taken in the shade. I'm seriously impressed with the pigmentation here. Pearl over black is a huge surprise, I didn't think it'd look so bright! The Moyou plate I used has 2 twin designs, one being the exact negative of the other, an opposite engraving if you prefer, and it's actually been fairly impossible to tell which nails were black over white or white over black. I also enjoyed the smell of the solvents used in this collection, or lack thereof. Not that I make a habit of sniffing my bottles but they do not have any strong scent whatsoever, they just smell like your average polish, which is a huge plus. Finally, I can only add that I'm usually not a fan of minis or smaller sized bottles but given the quality of this collection, I have all the more reason to wish they came in full size. You can purchase the Celestial Cosmetics & Color4Nails Stamping collection on Color4Nails.com for $7 each (international shipping available).